I just returned from our summer vacation to Oregon. I love Oregon’s coast during the summer when the inland valleys are 90 degrees and the coast is shrouded in low clouds, fog and temperatures in the 60’s. While driving on highway 26 from Portland to Cannon Beach you start to see signs for picking your own fruits and berries. Blueberries, blackberries, marionberries, apricots, and cherries were in season this last week and they were at the peak of their season. I could not help but stop and get some fresh Oregon Blueberries. The plan was to bring a basket back and make blueberry jam. Well, the berries never made it to Cannon Beach! Less then an hour after buying those blueberries they were in my stomach. One of the cool things about the Northwest is that wild berries grow along the side of the road in many places. These berries ripen and fall to the ground as thousands of cars and humans pass by at 65 miles per hour. It is a foragers dream to stop on the side of the road and pick berries to your hearts content. We stopped by a particularly prolific blackberry bush with the largest, sweetest berries I have ever tasted. These blackberry bushes were growing wild in a thicket the size of a basketball court. My favorite berry of all is the blueberry. Several years ago while fishing for salmon on a remote river in Alaska, I picked handfuls of wild blueberries and ate the sugary masterpieces on the side of the river watching brown bears catch spawning salmon. Oregon blueberries seem to be larger then the ones I picked in Alaska but they were just as sweet as the ones I gorged on that day on that remote salmon stream. My favorite way to eat blueberries is in a jam. Blueberry jam on fresh warm buttermilk biscuits with melting butter are heavenly. I have included a short video recipe of my favorite blueberry jam recipe for your review. Even though I ate all the Oregon blueberries I bought on the side of the road before I had a chance to make jam, I was able to find fresh, plump Oregon blueberries at Costco. I could hardly tell the difference and the ones at Costco were very fresh. I hope you enjoy the video recipe and get a chance to can some blueberry jam yourself this summer! Place blueberries in a food processor; cover and process until blended. Transfer to a stockpot. Stir in the sugar, lemon juice, cinnamon, lemon peel and nutmeg. Bring to a full rolling boil over high heat, stirring constantly. Stir in pectin. Boil for 1 minute, stirring constantly. Remove from the heat; skim off foam. Ladle hot mixture into hot sterilized half-pint jars, leaving 1/4-in. headspace. Remove air bubbles; wipe rims and adjust lids. Process for 10 minutes in a boiling-water canner. Yield: 5 half-pints. Note: The processing time listed is for altitudes of 1,000 feet or less. Add 1 minute to the processing time for each 1,000 feet of additional altitude. Purslane is commonly known as Pigweed, Verdolaga, Pusley, or Little Hogweed and is a very delicious edible weed that is probably growing in your yard right now. Purslane grows everywhere. Purslane likes heat and usually grows best during July and August and can be eaten raw in salads, sauted with onions and garlic, or blanched and served with a little olive oil, salt and pepper. Purslane contains high amounts of mega-3 fatty acid generally found in vegetables, as well as small amounts of EPA and DHA, omega-3 fatty acids more commonly found in fish. This essential fatty acid plays a key role in maintaining heart health. 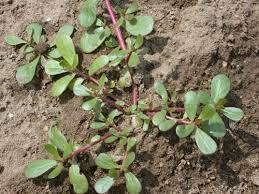 Purslane is also high in vitamins A, C and E, which are known for their antioxidant powers. This edible weed also contains two Beta Pigments, beta-cyanins and beta-xanthins, which act as antioxidants. Vitamins and minerals: Purslane is low in calories and fat, but this weed does contain high amounts of dietary minerals such as iron, magnesium, calcium, potassium and manganese. Substitute Purslane for other leafy green vegetables in your cooking or use it to garnish sandwiches, add it to soups and stews, and incorporate it into your salads. If you’re pregnant, avoid purslane as it can make the uterine muscles contract. Purslane has a slightly pepper flavor and can be tart at times. How do you identify purslane? 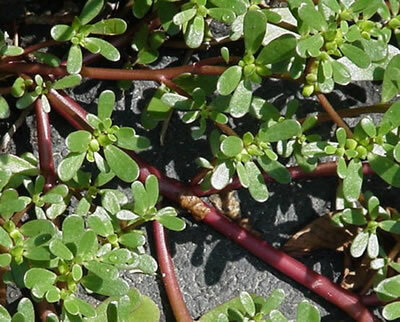 Purslane grows out from one main taproot, sprawling out in all directions. The stem ranges from green to pink to red, and sometimes can be brown in color. The stem can be quite thick- as wide as a finger towards the middle of the rosette, and tapers down to a thin stem at the outside. There often are thinner stems branching off of each larger stem. Along the stems at regular intervals are thick, fleshy, rounded teardrop shaped leaves. The top of the leaves are a shiny, dark green, while the underside is a more matted light grey green color. Purslane has small yellow flowers that only open up in the morning. 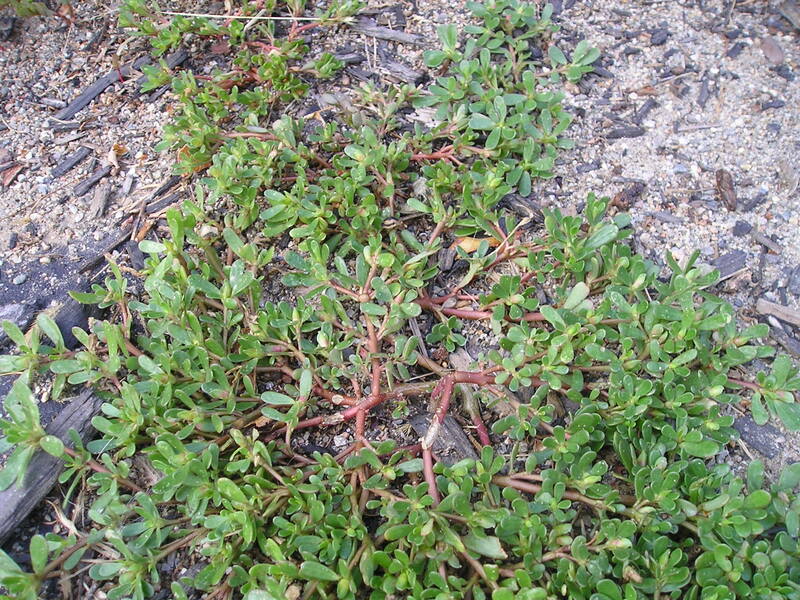 There is a plant that looks similar to Purslane that is poisonous. 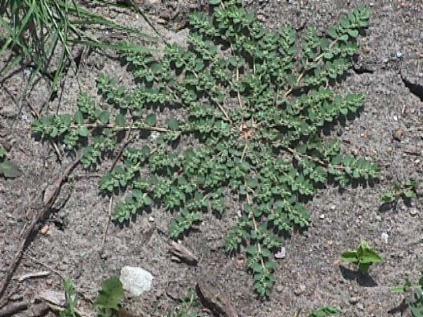 The poisonous plant is known as Spurge. The stems of Spurge are much thinner than Purslane stems, and spurge leaves are thin, unlike purslane’s thick, succulent leaves. Spurge is poisonous, and you don’t want to be eating it, but fortunately it’s easy to tell Spurge from Purslane. When you break the stem of a Spurge plant a white, milky sap will leak out of it. When you break the stem of a Purslane plant you do not get this milky substance. The following picture is of a Spurge Plant. ALWAYS MAKE SURE THAT YOU HAVE IDENTIFIED ANY PLANT AS SAFE TO EAT BEFORE EATING IT! Cast iron is the material to cook with. Yes, there are fancy and expensive stainless steel and Teflon cookware that you see used in restaurants and on the cooking shows. While These are good pans to cook with, they do not compare with the sturdiness, and durability of cast iron. Cast iron skillets conduct heat beautifully, go from stove top to oven with no problem and last for decades. The best benefit of cast iron is the cost. You can buy a good cast iron pan for about $20 and it will last you a life time. I love using cast iron in my wood fired oven because I do not have to worry about the high heat damaging the pan or Teflon coatings. If you season your cast iron cookware properly, the cookware will perform as good or better then the most expensive Teflon non stick pans on the market. The key is proper seasoning of the cast iron before using it for the first time. Many people are afraid to use cast iron because they do not know how to season the pan and they think that it is a long and hard process. Seasoning cast iron cookware is easy and requires very little effort. The key to successful seasoning is to wash and dry the cookware, coat it with a thin layer of cooking oil and then baking it in your oven for 1 hour. At the top of this page, I have included a short instructional video on how to season your new cast iron cookware. If you do not use cast iron in your kitchen you are missing out. Cast iron will add flavor to your foods and will be a faithful companion in your kitchen for years. Many people pass down their cast iron cookware to family members for generations. The only thing to remember is to never wash cast iron cookware with soapy water once you have seasoned it. Soap will remove the seasoning that you have worked so hard to maintain. I use cast iron most of the time in my kitchen and I encourage you to do the same. I have not had much time lately to update this blog. I have been extremely busy with my sons graduation, the end of the school year, work, sporting events and I have also been busy planting the new garden. However, I have been able to take the last few weeks to get to know my wood fired oven better. It is not as easy as lighting the wood and then cooking! The temperatures in this oven are different in every location. The oven dome can be 1300 degrees and the floor only 650 degrees. It is challenging to learn how the oven performs but it is definitely worth the effort. I have now made several meals in the oven. I have roasted chicken, rib eye steak, flap steak (Hanger), pork chops, vegetables and I have baked pizzas and cinnamon rolls. Every one of these dishes had a wonderful flavor that only can come from cooking in a wood fire. People ask me why I don’t just use a regular stove since that is the quickest and most modern way to cook. My answer is – the modern stove does not compare to the wood fired oven. I do not think that our electric and gas powered ovens of today are an advancement over the traditional ways to cook. They are definitely technologically advanced but when it comes to taste, they are light years behind. The following are some of the pictures of the food I have cooked in the oven and a couple pictures of the finished garden. 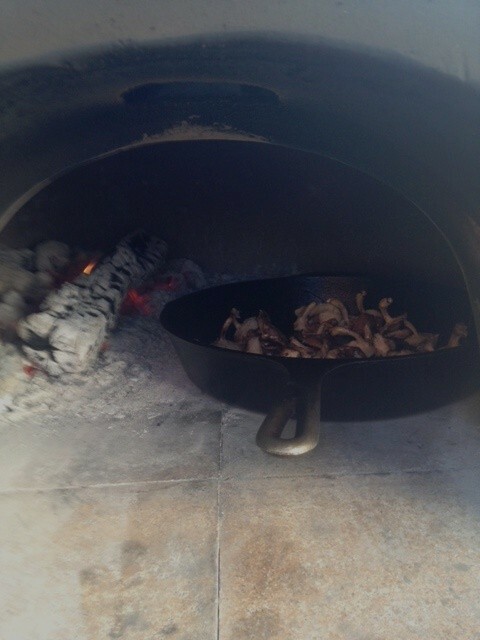 THE WOOD FIRED OVEN – DAY 6, THE FINAL FIRE! The time has finally come, the six day curing process for my wood fired oven is over! It has been a long 6 days. I was lucky to have a good stretch of weather that lasted 6 days straight. The weather is suppose to change tonight and bring cold temperatures and rain. It was actually a lot of fun to cure this oven. Of course, it is much more fun when the weather is nice. I think it would have been miserable if the weather had been cold and wet. In the beginning, I looked at this curing process as a major chore that had to be endured to get to the point where I could finally use my oven. Surprisingly, this process was not a chore at all and was a actually a tremendous amount of fun. I learned a lot about building, stoking and controlling the fire in the oven. It is not like a campfire where you light it and let it go. In the oven, you need to be alert that you are not exceeding each days curing temperature and you have to be constantly manipulating the fire to keep it from getting to hot or too cold. Today, I got the oven to a constant 800 degree temperature with a few spikes in the dome reaching close to 950 degrees. I noticed something today that I had not noticed on any other day. The black soot in the oven that had covered ¾ of the dome was now gone. When the oven reached 800 + degrees the black soot all but vanished. I have read that this means the water is finally out of the oven and it is cured. I am not sure if that is correct, but I am confident my oven is finally cured and ready for its first hot cooking fire. Just before closing the door on the oven so that it would stay at temperature for the next several hours, I toasted the completion of my six day odyssey with a Bloody Mary! Yum! Be cautious and careful to not exceed each days temperature by to much. However, realize that it will happen, it is normal for the temperature to spike and the oven will not crack wide open. Relax, have a cold drink and monitor the fire. Black soot is going to stain the outside of your oven near the door and vent. Don’t freak out, it is part of the charm. If you don’t like the stain use some soap and water and wash the soot off when the oven is cool. Always use dry, kiln dried or seasoned hardwood. If you do not know for certain that your wood is dry do not use it! Bring the oven to temperature and keep it there or slightly above for at least 3 hours. Once you reach the 3 hour time limit, let the fire burn down to white hot coals and close the door. The oven will stay at temperature for at least another 3-4 hours and will slowly cool down over the next 12 hours. Don’t panic if you see a hairline crack. My first and only hairline crack appeared on the 5th day. It was very small and you can hardly notice it. It also did not go all the way through. Small hairline cracks on the exterior and inside the dome are common and are caused be the expansion and contraction caused by the heat and cool down. Use the 6 days as a learning experience. View these days as training for how to fire and control your oven. I hope that the last 6 days of blogging about this experience will help those who are thinking about buying a wood fired oven. 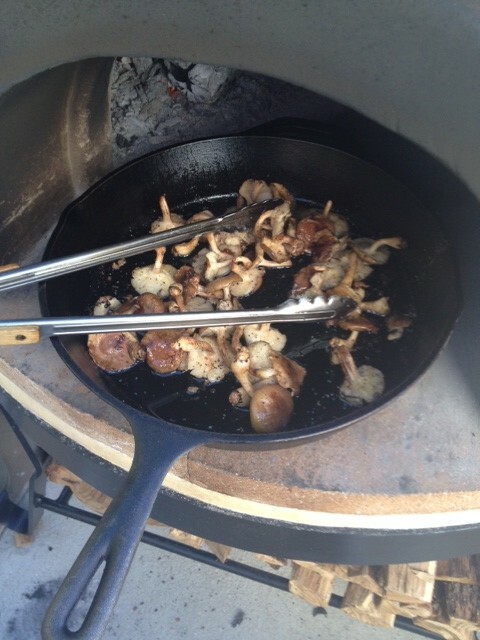 A wood fired oven is truly an investment in your quality of life and food preparation. I can not wait to spend this summer cooking and experimenting with this oven. Please subscribe to this blog to learn more about this wood fired oven and the recipes I will be sharing with everyone who is interested in cooking with fire! WOOD FIRED OVEN CURE – DAY 5, There is a light at the end of the tunnel! Day five of the curing process for my Forno Bravo Primavera 70 oven is now in the books. The goal was 700 degrees today. Once again, the fire was much easier to light and maintain with the dryer oak wood. If there is one thing I have learned during this curing process, it is the importance of good, seasoned, dry wood. Today also saw the first hairline crack in the oven. My best guess is that this happened when the heat in the dome spiked to 900 degrees. The crack is very slight and you can hardly see it but it is there. According to Forno Bravo, small hairline cracks in the oven dome or vent are a normal part of the heat up/cool down (expansion/contraction) cycle that all wood ovens experience. These small cracks do not impact how well the oven cooks or how long it will last. I am posting a picture of the crack for you to view. It is very hard to see the crack because it is so thin. I am just happy that this kind of crack is normal for wood fired ovens. There is a light at the end of the tunnel! Tomorrow is the last day of the curing process and then the oven will be ready to cook in. I am looking forward to not only building and watching fires in my oven but also cooking in it. Check back tomorrow for the final day of curing the wood fired oven. The 4th time was a charm! It was much easier today to get the oven to 600 degrees and keep it there. I used up the last of the green oak yesterday and I am now using some oak that was in a flash wildfire in Eastern Utah. This wood is much drier and ignites easily. Once this wood ignites, it has a constant flame and is much easier to control. I burned several large pieces of oak over a three hour period which gave me a really good base of white hot coals. Once I had this nice layer of coals, I put one more large piece of oak on the fire and then let it add itself to the pile of coals. After 3 hours, the dome was reaching 700 degrees and the sides were at 600 – 625 degrees. Once the oven reached these temperatures, I let the flame burn out and then closed the door on the oven. Similar to the last 3 days, the oven stayed at the desired temperature for at least another 3 ½ hours. The oven is now entering its 8th hour and it is still at 550 degrees. This system of bringing the oven to slightly above temperature over 3 hours and then letting it sit until the next day has really helped me regulate the temperatures in the oven.